Phantoms are involved in a clash of two table-toppers this Saturday night - and head coach Slava Koulikov insists it is essential they emerge victorious. The city team travel to Sheffield in their latest NIHL National Cup, Group B contest (7.30pm). And while Phantoms are in pole position in NIHL Division One South and the Steeldogs lead the way in NIHL Division One North, both sides are in urgent need of points in this particular competition as they attempt to overhaul group leaders Hull to reach the semi-finals. Phantoms have lost two of their three group games so far (all against Hull) while Sheffield boast one point from their only previous outing - an overtime loss at the hands of the Pirates. Koulikov said: “We’re three games in now and we’ve lost more than we have won. We need get our record back to 50 per cent and the way to do that is beating Sheffield. “There is no secret it is an important night for both teams and I’m expecting a tough game. 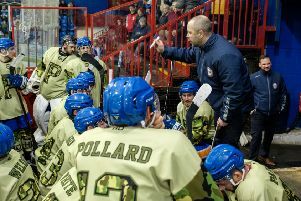 “We’ve beaten Sheffield home and away in the NIHL Autumn Cup, but they were missing a few players for the game in our building and I’m sure they will be stronger this time. “They are sitting at the top of their league table and they are there for a reason at this stage of the season, but we have to concentrate on ourselves. We need to get off to the right start, have the right attitude and hopefully that will lead to the right result. “The challenge is to perform for the full 60 minutes which is not something we have managed to do too often so far. We were pretty good in the home and away wins against Swindon, and we were also decent in Bracknell last Sunday after a sloppy opening period. “We’re still trying to sort a few things out and find the right connections in some areas. We’re not a finished project by any means. “Our powerplay is now consistently better than it has been in the past, but the penalty kill, which has been a strong point in previous seasons, still needs some adjustments this year. Phantoms return to league action on Sunday with a potentially tricky trip to Invicta (5.15pm). They were 5-1 winners in their previous visit to Gillingham just under a month ago, but Koulikov insists the Kent side cannot be taken lightly. “It is a very tough place to play,” he added. “We could easily have been in trouble in the first period the last time we went there. “Invicta have had very good results in their building lately against Swindon and Bracknell, and we know it will be a difficult night.